The product On the MindSync platform, customers can ask for the creation of a customized AI-based solution to their business problems, by creating a challenge. This challenge will be visible to all the community members. Interested experts on the platform will register their participation in the challenge after accepting the terms and conditions governing it. The expert (individual or team) participates in competition by send code and/or predictions. Winner that successfully creates the solution will submit their entry for the review of the customer as well as other experts in the community. Once the review is successful, the customer buys the solution that can be integrated into their business processes. MindSync will also be a repository for readymade AI-based solutions and training datasets that a customer can look for. MindSync will allow to host solutions on the platform and make it accessible via API without any deploying. This is dramatically simplify integration of the solution. Member — MindSync provides free registration for any person via web or mobile app by creating MindSync account. The benefits that the platform provides are only accessible via MindSync account. The member can be either Expert/Developer or Customer or both. Experts define problems supplied by customers. They help to formulate and adapt the problem. They accumulate ratings and values by participating in competitions and projects. Every member of the platform has track-record and verified rating that allows to evaluate the contribution to the platform. There is also available an option to pass KYC verification. The provided personal information is hashed. Hashes are stored by platform’s blockchain. The private data also helps in making the interaction between experts and customers more trusted and transparent, e.g. signing NDA before starting a project make greater sense. The platform allows customers to place tasks mostly in the form of a competition, since competition format provides the most efficient way of problem solving. Other forms of interactions are possible too and are subject to research. Organization/Group — Members can create an organization. It unites members into a group and provides more comfortable way for collaboration. Organization can also be a customer which initiates a competition. Organization provides privacy and restricts access to the datasets. Community — Basically, all the members and organizations are the platform’s community. The accumulated knowledge is shared among the community. Community is the pool of experts that can participate in solving and defining tasks. 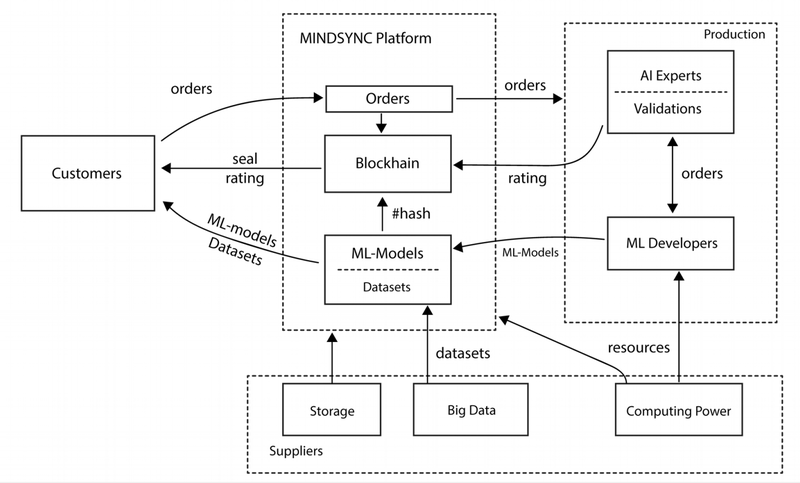 One of MindSync project’s main goals is the creation of a global community of DS/ML experts and using this huge talent pool to help solve business problems by creating cuttingedge AI-based solutions. Platform — The platform’s role is to provide technical support for the project’s ecosystem. It attracts members and expands the community. The platform is engaged in maintaining the project’s economy, models market and in developing resources for the community. The role of the platform will be assumed by the MindSync team prior to the development of the DAO. Dataset — A set of datasets in the MindSync system will be available. Datasets can be private and public, accessible to the whole community or within individual(s) organization(s)/group(s). In the case of publication, it’s necessary to specify the conditions (license) on which the other participants of the platform can use the information contained in dataset. Datasets can be provided by participants in a packaged (archived) form and can contain any kind of information, but basically it can be imaged as CSV file or set of images. The information contained in datasets is hashed. Hashes are stored in the platform’s blockchain. This functionality provides guarantees of integrity and immutability of the information contained in datasets. Solution — Basically, this is the final executable and source code representing learning procedure and final inference. The MindSync platform also provides tools for versioning and hashing code developed by the participants. The release mechanism creates a snapshot, computes the hash and stores it in the blockchain. Project/Competition — A set of terms and conditions in the context of which the task and the goal are defined. Requirements pertaining to the development of solutions is iterated in the process of communication between customers and experts through the MindSync platform. The mechanism of interaction of participants depends on their role. In the process of interaction, knowledge is generated in form of experience, models or source code. These artifacts are made available to other participants, serve to accelerate the dissemination of information and strengthen the Community. Incentives for Members includes knowledge, contribution to the community, personal rating as verified skill score and money as a reward for their work. For Customers, the benefit are in the form of solving a specific problem by attracting a lot of specialists and providing a quick test of a large number of hypotheses, or consulting in the case of absence of its in-house experts. It is also important to notice that interaction with the Community includes healthy communication and consultations with several experts, which negates the likelihood of making a wrong decision.